The indigenous peoples of the subarctic regions of North America, Russia, and Greenland are known collectively as the Eskimo. This grouping of tribal nations includes people of various smaller tribes, and some even go by different names, such as the Inuit in Canada. The Native American Mint is celebrating tribal nations across North America with a series of proof Native Dollars representing each state or region. 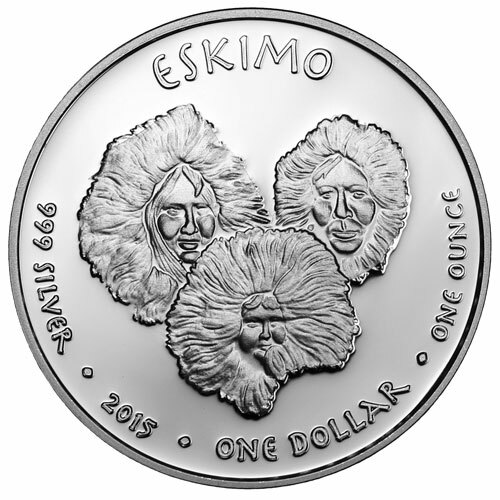 Today, the 2015 1 oz Silver Proof Alaska Eskimo Polar Bear coin is available on Silver.com. First release in the silver proof Native Dollars Series! Honors the state of Alaska and the Eskimo people! Ships in a plastic capsule to protect the coin’s finish. Face value of One Dollar is issued by the Native American Mint. Coin bears NO LEGAL TENDER status. Features the image of an Eskimo family on the obverse. Polar bear family graces the reverse. Includes a satin proof finish. Each coin in the Native Dollar Series from the Native American Mint features unique obverse and reverse designs representing tribes from different US states. The chosen tribes either currently live or historically resided within the state represented on the coin, whether the entire tribal nation lived there in whole or in part. The reverse design includes an animal species native to the state and/or important to tribal life in the region. The Eskimo peoples of Alaska are part of a larger grouping of indigenous peoples who have long inhabited a region of the globe known as the norther circumpolar region. This includes tribes found in the eastern Siberia region of Russia, the US state of Alaska, vast stretches of Canada, and the island of Greenland. On the obverse you’ll find the image of an Eskimo family wearing traditional clothing used to keep warm in the Arctic conditions. Engravings include the name of the tribe represented, the purity, metal content, year of issue, face value, and weight of the coin. 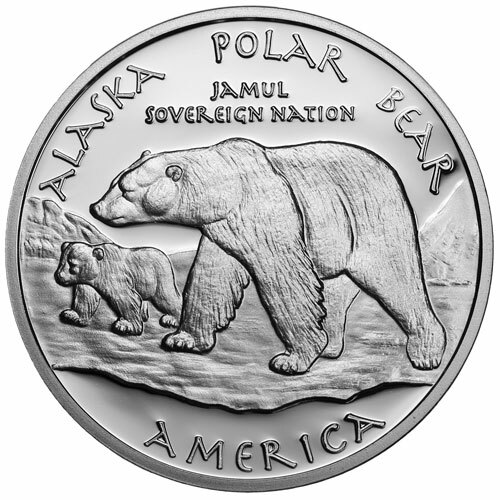 The reverse face of the coin includes the image of an adult polar bear and its young cub as they walk along the frozen icecaps of the Arctic Circle. The engravings on this face identify the state and animal present in the design, as well as the word “America” at the bottom. Each coin from the Native American Mint reflects the sovereign status of Native American tribes, and features a satin finish that is mirror-like, rather than the traditional matte proof finish. Please direct your questions to a Silver.com associate at 888-989-7223, chat with us live online, or send us an email.